Welcome back by my blog again today, everyone! 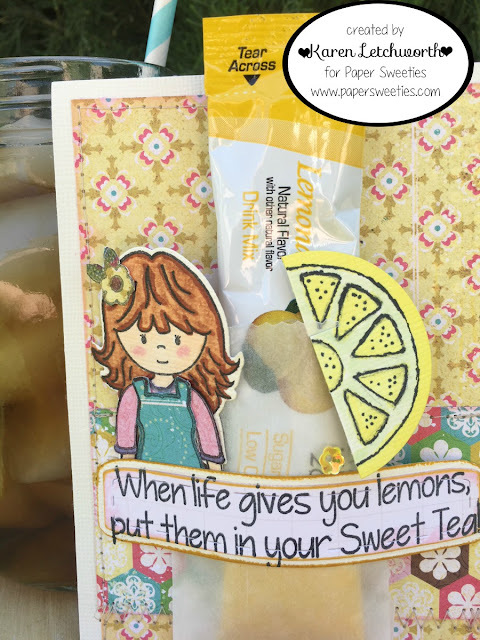 I'm so happy you've stopped by as I share a bit more from the FABULOUS new May Release from Paper Sweeties. If you happened to miss my Paper Sweeties projects from either Monday or Tuesday, you can see them by clicking on the links. 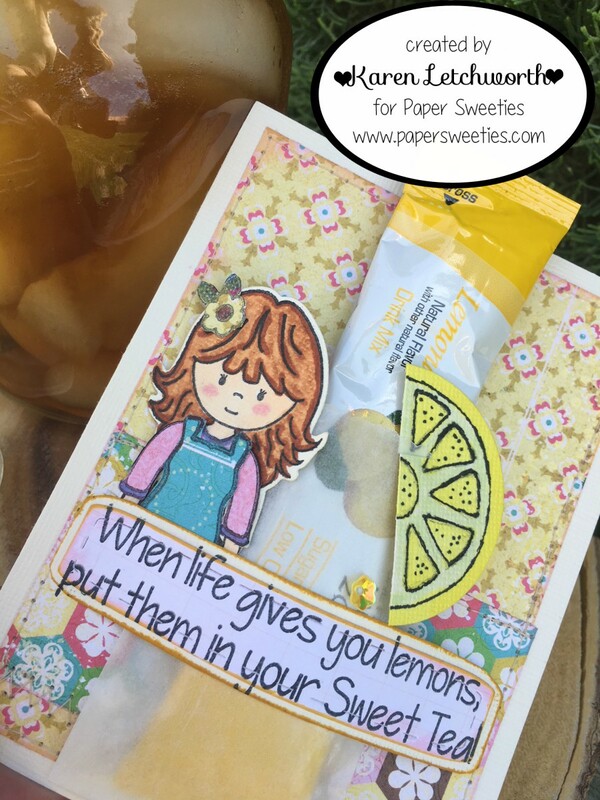 Along with my teammates, I've been sharing some fun new projects using the new releases from Paper Sweeties including the Hey Y'all Stamp Set and Treat Box Sweet Cuts. Both of these amazing new sets are available for purchase now in the Paper Sweeties Shop. For today's post, I created a sweet card that has a little glassine envelope where I've tucked in a lemonade packet to go along with the ADORABLE sentiment (yup, yet another) from the super sweet Hey Y'all Stamp Set. I made the little lemon slice myself by cutting the circle with the smallest size Circle Scallop Frames Sweet Cuts and free-handing the rest of the lemon. 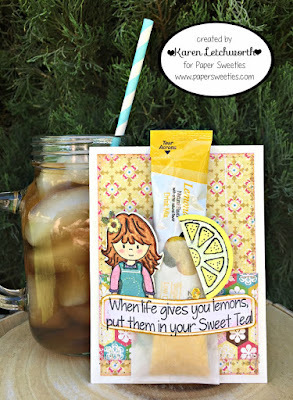 I used the sentiment "When Life Gives You Lemons, Put Them in Your Sweet Tea" and stamped it on a banner that was cut using the Sweet Borders Sweet Cuts. All ten sentiments in the new Hey Y'all Stamp Set are SO super cute. As a note, you'll see that I placed a glass of iced tea in my photo, and I stuck a Paper Straw in it. There's also a Cookie Dough Sequin on my card. Just above the sentiment banner, you will see Madison. I stamped Madison, and cut her with the Madison Sweet Cut. Her dress, as well as the flower in her hair, are from the At The Beach Stamp Set. All the stamp sets found at Paper Sweeties include adorable outfits, sentiments and extras to enhance, and work together with, EVERYTHING found at Paper Sweeties. It's just a whole lot of sweetness and fun! Below you will find the list of all my Paper Sweeties friends who have created a special something for you today. Just click on each of their names to be taken directly to their blogs to see their sweet projects. We all hope that you will treat yourself to these awesome new sets. We know you'll love them as much as we do! This is adorable! I love the lemon. So very sweet! Love your handmade lemon slice... very awesome! Adorable card and great little giftie!